Between the two of us, we run three creative businesses and have a wealth of contacts in the creative industries. As such, we are able to help with a wide variety of creative services. If we can't help you ourselves, we usually know someone who can, and will be happy to put you in touch with the right artist/artisan to make your project come to life. Now and again, we come across broken-hearted people whose pets, children, cleaners or relatives have managed to knock a precious lifecast off a shelf, smashing it on the floor below. If this has happened to you - either with one of our casts or one made by yourself or another company - please don't panic. Just collect together the pieces in a shoe box or similar and get it to us. You would be amazed what we can do with a box of broken bits in a relatively short amount of time. Additionally, some people have had bad luck with lifecasts made by other companies or from DIY kits with sub-standard materials or techniques (a common one being casts that haven't had the correct amount of drying/curing time and have developed mould over the years as a result). Although we cannot promise to be able to save these, in some cases we may be able to remould and recast the original in a more durable material, repairing any damage along the way. Very often we can carry out repairs so that you'd never know the damage had occurred in the first place. The same two belly casts after 'upgrading' - including strengthening, hanging, smoothing, painting and decorating. You may have an old lifecast that you wish to do something really special with - perhaps upgrading a plaster cast of your children to a real bronze, or perhaps you've been meaning to decorate a plaster bandage belly cast but know you'll never get around to it. Whatever you dream of having done to your casts, so long as you've kept the original we can upgrade them at any stage in the future. Our repairs service even means that we can take out imperfections that may have existed in the original - providing you with a gorgeous all-round quality finish in the material of your choice. 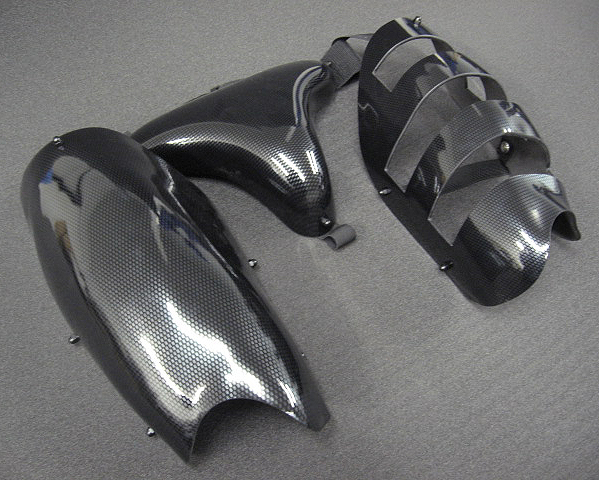 NB:- Casts can be from any source - DIY, kit, other companies or our own. In addition to our near death and death casting service, we are sometimes asked to create bespoke memorials/sculptures to honour people who have been dead for some time and therefore cannot be lifecast or 3d scanned. 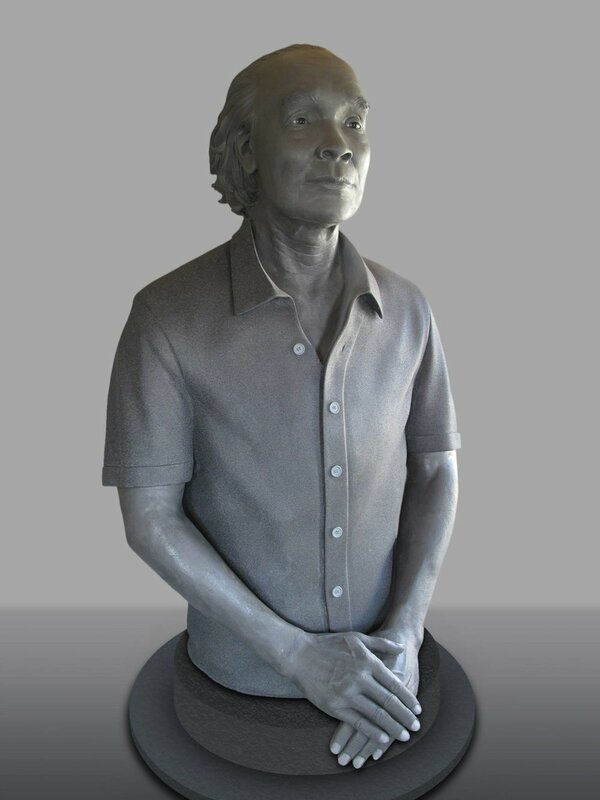 Using a combination of traditional sculpture techniques and state of the art digital modelling techniques, we offer a service that is second-to-none to capture the likeness of your loved one in incredible detail on a par with our lifecasting work. These pieces can be made in true foundry bronze to create beautiful, lasting outdoor or indoor sculptures to almost any scale. In addition to portrait-style memorial sculptures, we can also create additional ornamental sculptural elements for your memorial gardens such as bronze wreaths, pillars, sconces and so forth. Lifecasts don't have to be merely decorative - we can turn them into functional objects, from keyrings and jewellery to coat hooks, belly bowls and wall-sconces. It is best to have an idea of your intended purpose before we take the original mould from your body as the purpose may influence design/method. However, it is sometimes possible to take a pre-existing lifecast and adapt it or remould it to suit a completely new purpose. Through his modelmaking company, All Handmade, André Masters is able to offer a bespoke armour and wearable art service for performers, cosplayers, historical/period re-enactment, fantasy/club wear, pop videos, television dramas and more. Costumes, masks, headdresses or armour can be made to your own designs, historically accurate recreations or we offer a bespoke design service that can reflect your ideas and needs. Armour and costumes are made using a lifecast of your own body so they fit as beautifully and as comfortably as possible. We work with a combination of traditional and state of the art methods to create items made in everything from leather to cast metals. 'Dragon lady' by CJ Munn (work in progress) - sold. Fancy something a little different for your home, garden or office but not sure about having a lifecast made? 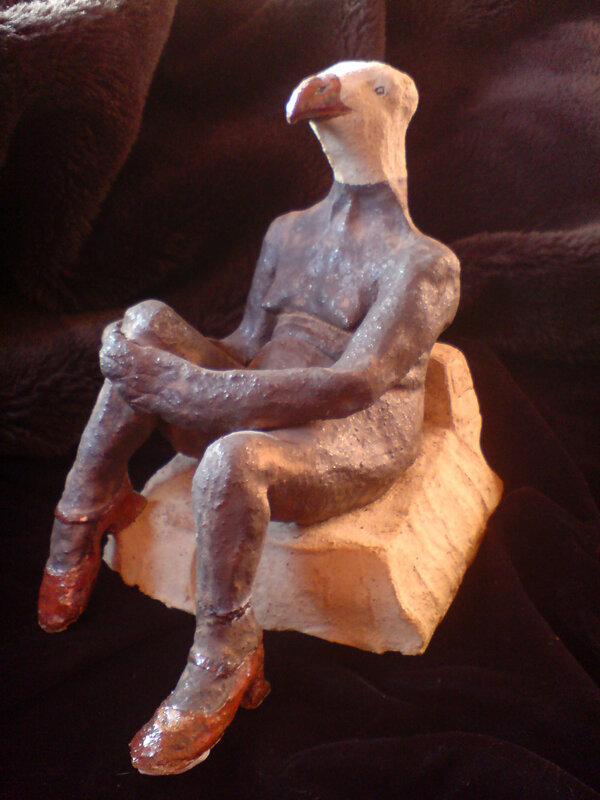 We can either sculpt you something unique to your specifications or find you a sculptor suitable for your requirements if you have a particular style in mind. 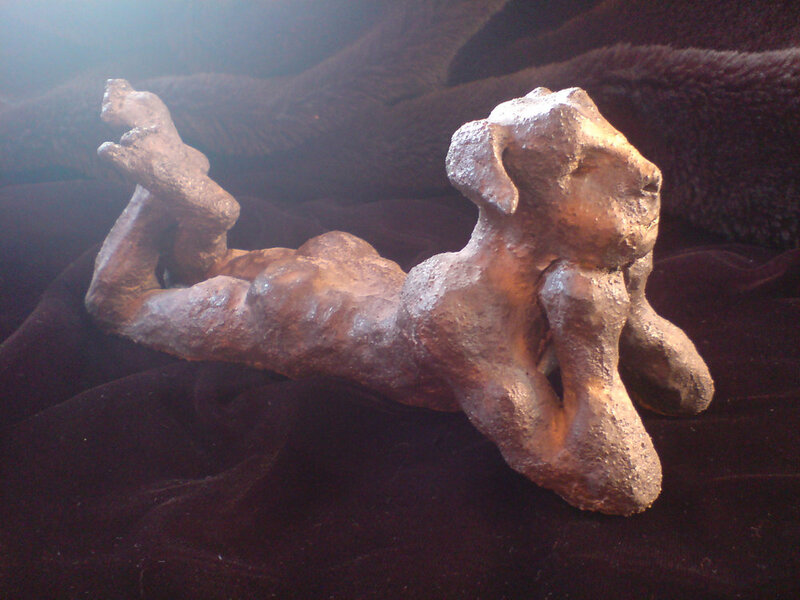 Prices range from around £500 for a bespoke ceramic piece to several thousand pounds for larger bronze pieces. Get in touch with your ideas and budget and we can discuss all the possibilities for your bespoke art. 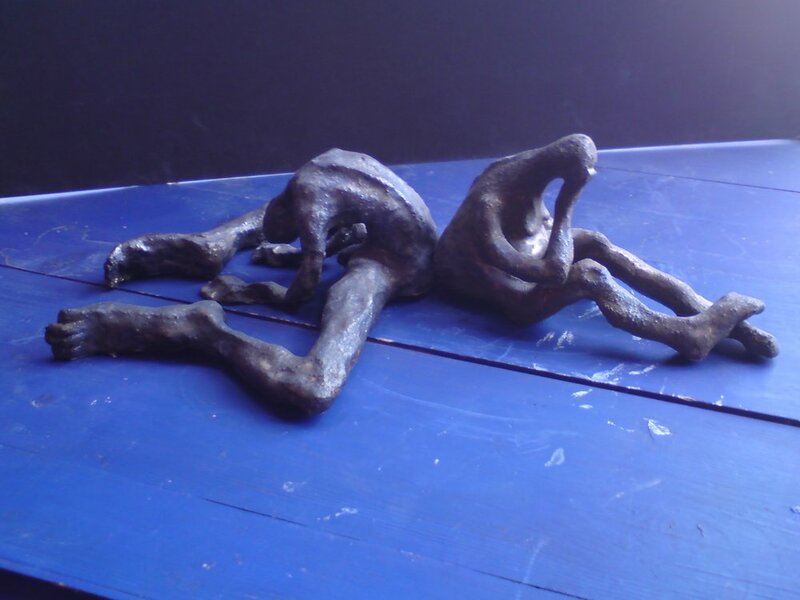 There's nothing to say your lifecast has to be made from traditional materials like bronze or plaster. We work with some of the UK's finest food artists to help make their edible visions come to life. From Sharon Baker's bread body installations, to NorthStar Cakes' incredible horror-style cake toppers and even an edible elephant poo and crocodile with award-winners Cake Bomb - we love working with other artisans in ice, chocolate, cake, bread, jelly or sugar. Other services include but are not limited to:- public art, model making, puppet making, mask making, sharding/mosaics, illustration/graphic design, prop weapon design (Cosplay, reenactment or film/TV), murals/trompe l'oeil, customisation of personal artefacts, creating copies of historical objects or art items for museums, film and television, interior design, and much much more. Please email as many details as possible of your requirements/vision with specifics about size, deadline, approximate budget, materials, intended purpose and any photos/designs you may already have.